The iPad is a magical and revolutionary device but the choice of how to protect it can be downright mystifying. Do you go for a portfolio or a sleeve? Should it be a soft case or hard case? My new favorite iPad protector is made by Belkin. The Belkin Pleat Sleeve ($39.99) for the iPad has styling that is simple and unobtrusive. I don't want to draw attention to my iPad and have it stolen. If you want everyone to know you have an iPad, this case isn't for you. The sleeve currently comes in either black or "perfect plum" (purple). 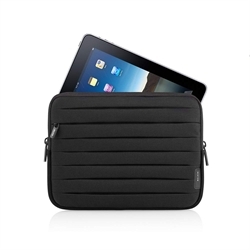 The Pleat Sleeve is made of lightweight neoprene and fits snugly around your iPad. All sides of the case are padded, but the glass front is particularly well protected, since the glass is the most common break point. However, the best part of the Pleat Sleeve is the zipper hidden in the pleats which has room for your earphones, iPhone, charger and more. I love putting my iPad in this case and having everything I need for a productive afternoon at the coffeehouse. The material of the Sleeve is tightly woven, so I expect it to hold up for a long time.